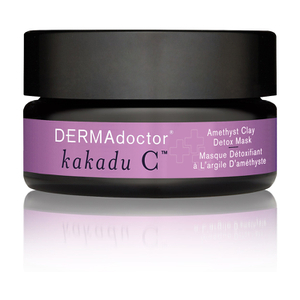 Improve your skin's overall appearance with DERMAdoctor Kakadu C Intensive Vitamin C Peel Pad with Ferulic Acid and Vitamin E; a two-in-one peel and treatment that works to restore a brighter, smoother and firmer complexion. 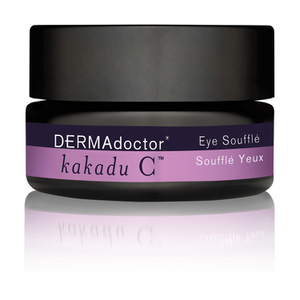 Fortified with seven sources of AHA and BHA, the intensive treatment gently exfoliates and refines skin, whilst Kakadu Plum (one of the most concentrated natural sources of Vitamin C) promotes a luminous glow. A dose of Australian Lime Caviar delivers antioxidant protection to defend against environmental aggressors. 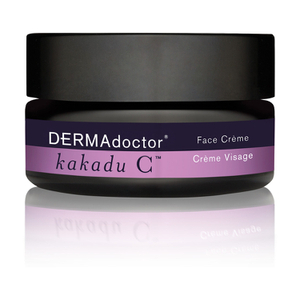 Easy and quick to use, you can expect a rebalanced, revitalized visage with a more even skin tone and texture. Hypoallergenic. Non-comedogenic. No animal testing. Free from soap, oil, fragrance, gluten, phthalate, sulphate, silicone and parabens. Use once daily. Apply to clean, dry skin. Avoid eye area and lips. Leave on for 1-3 minutes and then rinse thoroughly with water. Sunburn Alert: This product contains an alpha hydroxy acid (AHA) that may increase your skin’s sensitivity to the sun and particularly the possibility of sunburn. Use a broad spectrum SPF 30 sunscreen, and limit sun exposure while using this product and for a week afterwards. Aqua (Water), Glycolic Acid, Rose Centifolia Flower Water, Lactic Acid, Potassium Hydroxide, Mandelic Acid, Hyaluronic Acid, Polysorbate 20, SD Alcohol 40-B, Glycerin, Terminalia Ferdinandiana Fruit Extract, Microcitrus Australasica Fruit Extract, Salix Nigra (Willow) Bark Extract, Malic Acid, Algae Extract, Superoxide Dismutase, Camellia Oleifera (Green Tea) Leaf Extract, Camellia Sinensis (White Tea) Leaf Extract, Aloe Barbadensis Leaf Juice, Squalane, Papain, Ferulic Acid, Vitamin E Acetate, Oleanolic Acid, Enantia Chlorantha Bark Extract, Phenoxyethanol, Potassium Sorbate, Ethylhexylglycerin, Butylene Glycol, Sodium Benzoate, Citric Acid. I've been using this product for quit long time. It's amazing. it's deeply clean the skin and make it clean and bright. I had researched daily vitamin peels and stumbled upon different brands. I did order a set from a well known brand but I was upset my the fact that alcohol was the second ingredient. I decided to continue my search as I wanted something that would perform as it was intended and I could hopefully see results. 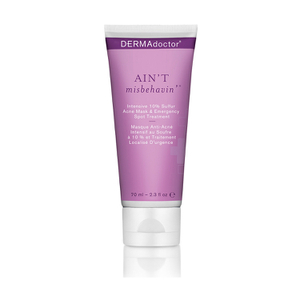 I have used Dermadoctor in other treatments and decided to give this a try. I have found exactly what I wanted and needed!! I use them after I cleanse my face and they have shown a great improvement of my overall skin tone and accelerated my treatment for hyperpigmentation. You will see a difference in 2-3 weeks time for hyperpigmentation and I find them gentle enough for daily use.